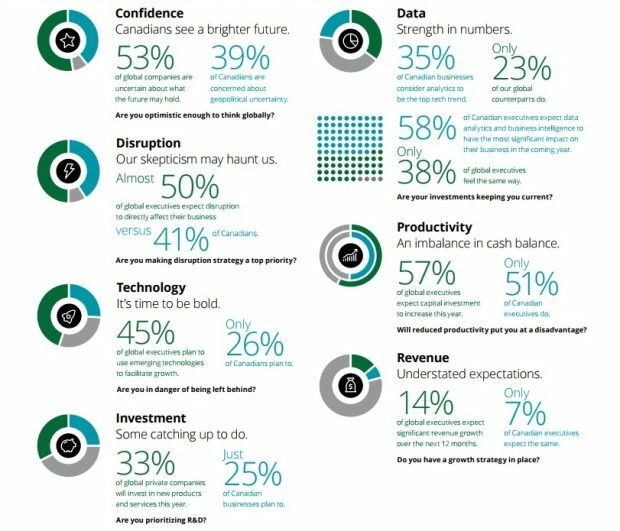 A new Deloitte survey suggests that fewer than half of Canada’s private companies expect emerging technologies to impact their business, and even fewer are planning to digitally transform themselves to accelerate their growth. Forty-one per cent of Canadian survey respondents said it is likely their company will be disrupted by a non-traditional competitor in the next two to three years, compared to 49 per cent of global survey respondents. And while 45 per cent of global executives suggest they will use tech to improve growth, only 26 per cent of Canadian companies plan to do the same. Yet the survey found that 90 per cent of Canadian executives from private companies were confident in the success of their company over the next 24 months, and that 57 per cent of business executives from private companies in Canada expect their revenue to increase over the next 12 months.